I have found Eddie Ayres’ book, Danger Music. I read it in one go on a flight to Dubai. I found it compelling, foreboding and joyful. This was the first time I was introduced to Eddie. I had known him as Emma Ayres as late as 2014. From 2009, I listened to Emma share her passion for music and teaching music on my drives into Canberra. She hosted the early morning Classic FM program, Classic Breakfast, on the ABC. 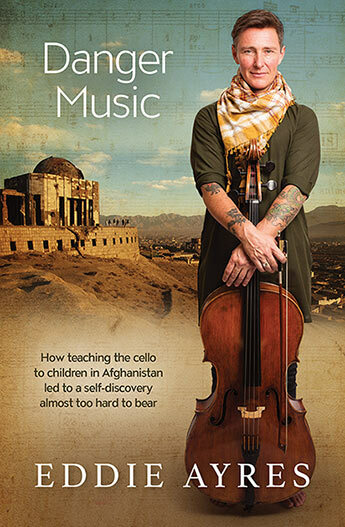 Danger Music recounts Eddie’s journey to teach violin, viola and cello at the Afghanistan National Institute of Music in Afghanistan in 2015. In the book, Eddie discusses depression and gender dysphoria. Reading this, I felt profoundly sad that I did not know about his experiences. I may have misread the book, but my understanding of Eddie’s story is that his one-year in Kabul was also about hope too. His discussion of teaching at the National Institute resonated powerfully with me. One by one, nearly fifty children stood up and announced which instrument they wanted to learn. They sat tumbled together, two to a chair. There was never a moment of doubt. Every child knew exactly what they wanted to play, which instrument they wanted to dedicate themselves to. This scene might happen in thousands of schools around the world, but in this country it was unique. And it was a miraculous scene, because this was Afghanistan. As I read that, my plane was taxiing on the runway at Sydney. When I put the book down we were about to land in Dubai. The film’s narrative is driven by Ahmed’s quest to establish Afghanistan’s first national music institute and his determination to recruit street children and orphans as its students. Underpinning this essentially simple story, in a country where music had been banned, is the fact that what is at stake here is not simply just learning about music, but the freedom to express music as a basic human right. Eddie’s story gives another perspective on Ahmed who wanted to provide a co-educational experience for pupils and provide anyone with a passion for music the freedom to do so. I was in awe of Ahmed’s educational advocacy and understand why Eddie might think it important to walk with Ahmed in the face of immense odds. In all my teaching and coaching career, one of the moments I love best is the quiet before the students or athletes arrive. I have prepared for what might happen in the class or session and in that moment before I do have a quiet mind. The violins and violas were stacked on shelves, but the cellos were standing apart, all in a huddle, as if they didn’t trust the other instruments and were keeping to themselves. These lessons were possibly one of the rare occasions in these young people’s lives when they had truly individual attention from an adult, especially if they came from large families. A student could flash a look of such stress across their face that, if they were Australian, you would be contacting child services. I am focussing on Eddie’s first lesson in my reflection on hopeful pedagogy. The book is replete with teaching insights and the self doubts that teachers (and coaches) have. What brings us through the doubts, I believe, is passion. This was the moment when the students would sit down with their instruments for the first time. I had this moment with the cello when I was thirty-three and it was like meeting someone who I knew would be a lifelong friend. It can be an instant of bonding, comfort and great satisfaction. Or it can be a great mess. The bow is such a strange thing to hold. The aim is to hold it as loosely as possible, but firmly enough that weight can transfer from your hand all the way to the other end of the bow, up to seventy-five centimetres away. it can seem like magic, playing quietly where your hand is, and loudly at the thin end where there doesn’t seem to be any weight at all. The books draws to a close with news of a visit to the Institute by the Afghan poet, Massoud Khalili. The Youth Orchestra, with Eddie in it, played for Massoud. I had never heard the orchestra sound so good before. The string section’s sound was bold and warm and thick; it had a depth and integrity I had never heard before. I heard for the first time that the orchestra had taken it into their hearts the basic tenet of orchestral playing: the whole is more than the individual parts. In his conclusion, Eddie writes “the Afghanistan National Institute of Music remains one of the few successes of the last decade in Afghanistan”. He adds “and I wanted you to know the true challenges and therefore the true courage of Dr Sarmast”. I think the book is about Eddie’s courage too. It is a very open discussion, among other issues, of depression and personal identity. Beyond that I do think it is a wonderful example of what hopeful pedagogy might achieve. I put the book down as we landed in Dubai and went off on another journey of reflection about what it is to be a teacher and coach. I was in England three months ago. It is the first time the farm has grown corn in five years. It is vibrant. Without pushing a metaphor too far, the success of the planting had me thinking about changes coaches make to their pre-season and within season plans. A conversation about Franz Liszt on Classic FM focused my thoughts about innovation and variation. The theme of the discussion was ‘how do you transform convention?’. The changes to his concert performances, according to Heinrich Heine, brought about ‘Lisztomania’ (which was the subject of a Ken Russell film in 1975). One contemporary observer noted that his playing style (and that of Chopin) was “distinguished by the invention of new passages and difficulties, and consequently the introduction of new effects”. Which brings me back to thinking about the energy in seeds of ideas and individual adaptation. For me, it is an attempt to extend my understanding of performance and how we might account for transformation of conventional wisdom. This will lead me I believe, through another Classic FM prompt, to contemplate John Barry’s ‘beyondness’.